Legend has it the more paylines there are on a slot machine, the more chances pokies players have of winning and with the latest release from leading software developer Play’n Go, featuring a 50 payline format, you’ll be able to test out this theory. Golden Legend was released at the end of April 2015 from the the mobile-focused software provider, meaning we can test it out on both our smartphones and tablets. The Chinese themed slot follows the Chinese symbology of good fortune, featuring Chinese zodiac symbols, such as the tiger and the guardian foo dog, along with audio that twinkles through your speakers creating the perfect ambience. This pokies is very much about free spins, but while there isn’t an additional feature round there is potential for quite a big win. The best place to play Golden Legend is at any of the top-rated casinos recommended in our casino table above. These trusted sites offers both a desktop version so you can try Golden Legend on your laptop, as well as a mobile-friendly version meaning you can play the mobile compatible pokies by Play’n Go on your smartphone or tablet. We recommend these venues for trustworthy real money slots that aim to make players have an enjoyable online experience. With the standard 5-reels, this video slot by Play’n Go has a massive 50 paylines, as mentioned above, which can be played at once. This is said to give players more of a chance of winning. The video slot is standard in structure and features a bright colour scheme with simple A, K, Q, and J symbols on the reels. There is the usual wild and scatter symbols, but there is also two other symbols which appear on the reels at a certain point in time. Wild symbol – The wild is represented by the Ancient Chinese Gold Sycee symbol, which was currency the Chinese used right up until the 20th century, which makes for an interesting addition. 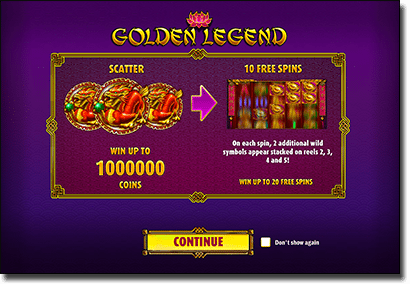 Scatter symbol – The scatter symbol is represented by the green-eyed golden dragon and players will receive 10 free spins if they land three golden dragon scatter symbols. Additional symbols – Two additional wild symbols will appear on reels two to five during the free spins. If you trigger the free spins and the wilds appear, you will notice that they will become stacked for the duration of the feature. This free spin feature can be re-triggered, with up to 20 free spins available. The free spin round is basically the feature, which is a bit disappointing because many slots offer both free spins and a feature, but coins can be won during the free spins round and there are quite a lot up for grabs. 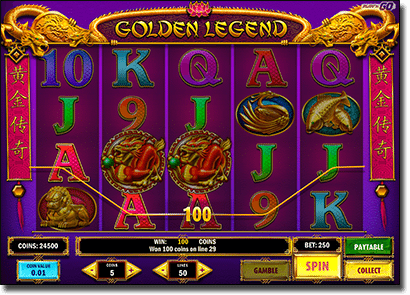 Jackpot – There is up to 10,000 times your initial bet available to be won on Golden Legend. That is up to 1,000,000 coins which can be won and paid out during the free spins round, which means there are some potentially huge wins on this slot. Gamble option – The gamble option which Microgaming became ever so popular for, has now been incorporated by Play’n Go, with the software developer regularly including this option. Double your winnings by picking the colour of the cards out of red or black, or quadruple your winnings by picking the suit of the card. This is your standard video slot, though the extra paylines make the game an intriguing pokies to try and once you start winning the coins there is an added reason to stay. Although there are no extra feature rounds, only free spins, the slot is quite generous in terms of how much we can win. There is a potential for quite a huge win, so it does redeem itself in this respect. We recommend this slot for anyone who is after a simple pokies machine with potentially big payouts; or even a superstitious player, since there is a strong theme of good fortune and prosperity. Play Golden Legend pokies online on your computer or mobile for fun or real money at House of Jack Casino, our recommended site for high-quality and diverse pokies.